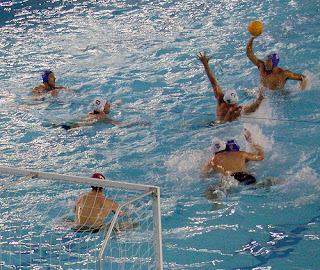 Calling Steven/Stephen McManus who played water-polo in Malta in July! After a lull in receiving the bizarre emails that Irish bloggers seem to attract, another one has hit my gmailbox. Alternatively, you may be called Stephen (or Steven) and want to hide under your bed and hold your breath, in case Frida is a cyber-stalker that you’d prefer not to catch up with! Either way, drop me an email (address up in the top right of the window) and let me know if you want to get in touch. Update - Could well have been the Clonard Water Polo Club (CWPC). Update - April 2007 - it's made it onto our screens. 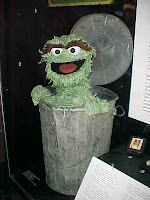 After years of waiting - well Slugger O'Toole mentioned it in January 2006 - twenty 15-minute episodes of the new Northern Ireland version of Sesame Street will be produced and broadcast on BBC NI starting in February 2008. Sesame Street variations already operate in over twenty countries. Aimed at children aged between three and six, the regular Sesame Street crew of Big Bird, Cookie Monster, Elmo and Oscar the Grouch will be joined by two specific NI Muppets. Set in a tree, one of the aims of the series will be to teach youngsters about life outside the suburbs, including turf-cutting. It’s good news for the local media industry, with Sixteen South writing and producing the series, and local actors behind the puppets too. Rumours that the two new puppets will be called Ian and Martin have yet to be denied! One of the things that distinguishes blogging from most mainstream journalism is the immediacy and the personal nature of posts. I’m just back from Tesco at Knocknagoney. Second visit of the night. It all started yesterday when someone kind gave us a Tesco handheld Bubble blower (powered by 2 AA batteries). The perfect gift for a two and a half year daughter. I found two batteries, screwed them in, and hey presto ... no bubbles, no whirring noise. One dead bubble blower. So tonight after bedtime stories (hers, not mine!) I nipped around to Tesco to swap it for another one. Four miles later, got home, screwed in the batteries. This time it whirred, and pathetically tried to blow bubbles. They half formed, and then burst, long before floating off into the air like the instructions say they will. Not impressed, got out into the car again to head back to Tesco. Another four miles. Breathless, he arrived to hear my plea. Having had two dud bubble machines, was it acceptable for customers to have to drive eight miles to return and replace Tesco products? “Tesco wouldn’t have much of a business if we refunded the mileage of everyone who brings something back”. I suggested that the queue for Customer Services wasn’t that long! And wasn’t it in their interests to compensate disappointed customers? Apparently not. When I explained by travelling eight miles just going back and fro from Tesco to return it, at business mileage rates I’d spent nearly half the value of the faulty product for no benefit. And when I suggested that other firms compensate customers with loyalty points (Sainsburys give you points if you request a product that they can’t get in stock, bmi give points if they run out of food on a flight, and even Holiday Inn give points when rooms prove less than ideal) ... we don’t do that. 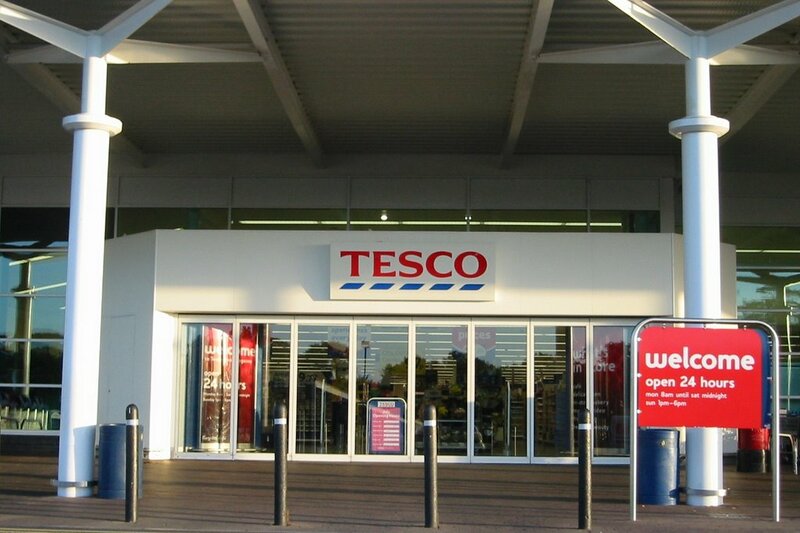 The conversation finished with me pointing out the door towards Sainsburys and saying that since it was just as close as Tesco, I’d be taking my trade there. And off we both stomped. Before you conclude that I’m a complete nit wit (maybe that’s why you read the blog! ), I do at this point have to admit that it felt slightly odd, nearly surreal, to be standing in Tesco debating compensation for a £2.97 child’s toy. But if the business that takes £1 out of every £7 spent by consumers in the UK doesn’t respect its customers, then I’m not sure it deserves their trade. 6 August update: Tesco replied ... but not sure I achieved a lot. Making the perfect cuppa ... with a plastic penguin. Ever since the rise in popularity of and familiarity with Linux (GNU-Linux for those that prefer), penguins have been popping up all over the place. 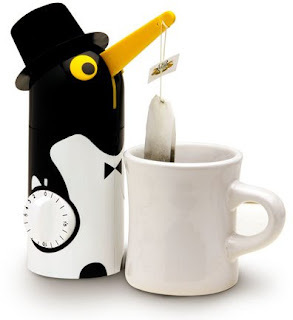 No better example that the Penguin Teaboy ... a penguin with a pocketwatch that lifts your tea bag out of your cup after your optimum brew time. $18.98 + P&P from Signals. In my opinion, a specious product if there ever was one. In our canteen, the perfect brew time can be achieved by popping the tea bag in the cardboard cup, fill with hot water, walk to the cash till, hand over the money, and immediately take the tea bag out and add milk on the counter behind the till. Use the human penguin: no need for some plastic! There’s an extraordinary feeling that comes from being drawn into reading a simple story, enticed to finish each page and quickly turn over to the next to find out what happens in the characters’ world. Paul Torday’s Salmon Fishing in the Yemen is a remarkable book, that elicits that feeling. I’d added it to my Amazon shopping basket after hearing a now long-forgotten review on the Five Live Mayo weekly book panel podcast back in February. The book remained unordered for a month or two before being finally broke my Lent embargo on bringing new books into our house. The novel follows the story of Dr Alfred Jones, a Civil Servant scientist specialising in fish. In particular, salmon, and their migration and breeding. Sheikh Muhammad ibn Zaidi bani Tihama wants to introduce salmon to the Yemen, in order to bring about a miraculous culture change that he feels only salmon fishing can achieve. The style of each chapter varies as Torday unravels the story of Jones’ involvement in this bizarre scheme. Diary excerpts, email chains, interviews and testimony, official reports and even a TV script. There’s some overlap between the timelines of each chapter, leaving the reader piecing together the overall story (told from the perspective of its main characters) in the same way as someone in charge of a national enquiry. The parallels between the Salmon Fishing in the Yemen and the Hutton Enquiry are plain. Mr Peter Maxwell is a cheap fake version of Alistair Campbell. Prime Minister Vent owes something to Blair. 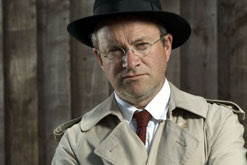 And Dr Alfred Jones plays a perhaps stronger version of Dr David Kelly. But the air of unease and impending tragedy is never far away. It’s a superb book that’s a very easy and delightful read. Highly recommended. On Friday night, we planned to go out for a bite to eat and see a film. Avoiding The Simpsons, Harry Potter and Transformers, we settled on the Testosteron, an intriguingly-described Polish comedy being shown in the Queen’s Film Theatre. Dinner at Café Renoir near the top of Botanic Avenue was good as always. (Try out their pizzas with sour cream. Divine!) The evening was dry, and we walked around the corner into the new entrance to the QFT. Lots of people milling around outside and inside in the spacious foyer. And then our plan went off the rails. Turns out that Testosteron (no final “e”!) was programmed as part of the successful Polish Film Festival that has been running for the last week. As was obvious from all the Polish been spoken in an around the QFT on Friday night. The wedding of Kornel, a young well-known TV scientist, to the famous singer Alicja, is to be the social event of the year. In a suburban reception hall, the final preparations are being made. While we didn’t get to see it, it good to know that the local venue had brought together the local Polish community for an evening, in much the same way as they do with the Bollywood matinees some Saturdays for the expanding Indian community in and around Belfast. And instead of being stuck inside for a couple of hours, we got a walk through QUB quad, and headed home for a couple of West Wings ... just started season five if anyone is tracking my new year’s resolution to watch the entire series this calendar year! 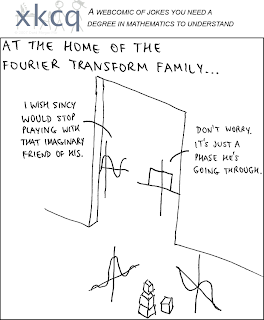 Fourier Transform - in a cartoon! A cartoon from the pages of the Irregular Webcomic comes a parody of xkcd: “a webcomic of jokes you need a degree in mathematics to understand”! Amongst more serious tomes, the escapism book—that will confirm to regular AiB readers that I’m a (literary) lost cause—was one of the Torchwood novels, a spinoff from the TV spinoff from Doctor Who. I’d picked it up in the BBC Shop in Belfast before it closed in the Spring. Based in a severely flooded Cardiff, the story echoes the inclement weather being experienced around the UK recently! Despite the tiny font size, Torchwood: Another Life (written by Peter Anghelides) was an original story and a remarkably good read, building on the familiar characters and locations. It could have done with some stronger editing to take out a couple of unfortunately repeated details and phrases, and to fix the two spulling miztakes I noticed as I breezed through. As the third Doctor Who series ended and companion Martha Jones (played by Freema Agyeman) stepped out of the Tardis for a half-season break to allow Catherine Tate a reprise of her Runaway Bride character, it was announced that Martha will be popping up in the next series of Torchwood which will noq definitely not be aired until early 2008. However, it will be shown first on BBC Two, unlike the first series which was run on BBC Three. If you’re a Whovian, or just a fan of sci-fi fiction, check out the Torchwood books. They’re as good as many of the more recent Doctor Who novels - the sci-fi equivalent of Mills and Boon! Aer Lingus is to begin flights from Belfast international airport to London Heathrow in August, the BBC has learned. It is understood the airline will operate four flights a day in each direction. Meanwhile, another Irish airline, Ryanair, is expected to announce new routes to the UK and mainland Europe. The budget airline plans to operate from George Best Belfast City Airport and has been in talks with the airport. Not sure if it'll be a regular feature, but AiB can report that the number of new Harry Potter books sighted on this morning's journey across to central London stood at 3. The first was left lying open in the rear galley of the red eye bmi flight to Heathrow. It was a strangely configured but fairly empty plane, and someone was keeping themselves busy turning the pages of JK Rowling's last installment of Hogwort's magic while we circled aimlessly over central London. The next two sightings were passengers on Bakerloo and Jubilee tube trains. Standing in very crowded carriages, precariously balancing their briefcases along with the weighty hardback Deathly Hallows. Quite mad. But then if Amazon delivered to one out of every 43 UK households on Saturday morning, and the high street bookshops and supermarkets have been flogging them too, there should be a couple of unfinished copies on most buses and tube carriages for the next week or so. 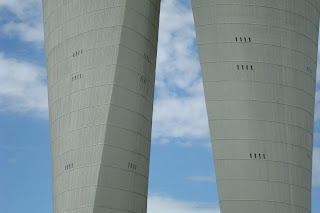 If you needed to build a couple of water towers to support a local community, there are two ways you could go about it. One would be to hire an architect and a civil engineer to build a round or rectangular structure to hold the stuff that’s currently in short supply (to drink at least) in Gloucester this week. The other approach is to commission a sculptor to help disguise the enormous structure by making it a work of public art that is a delight to look at. 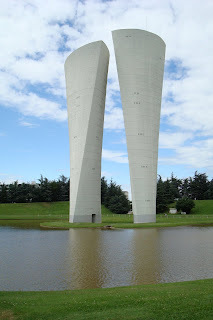 The city of Valence took this latter approach when in 1970 they built two “futuristic water castles” (deux châteaux d’eau futuristes) in the middle of a lake in Le Parc Jean Perdrix. The sculptor was Philolaos Tloupas (no English translation of his Wikipedia page yet). More snaps over at Flickr. As well as devouring the three available books—it was still a trilogy in the traditional three parts in those days—I discovered that the school library had a gem hidden away in the non-fiction section (with a Dewey number taped to the spine), and not filed in fiction under Adams, Douglas. 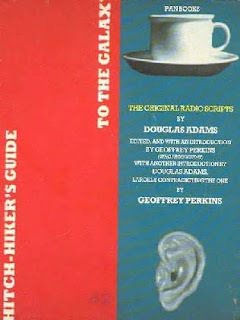 The HHGTTG original radio scripts, setting out the dialogue and musical queues for the various “fits” that made up the BBC Radio 4 series. Subtly different from the novels. Years later, (ie, a mere two years ago), it took quite a while to track down a copy of the hilarious scripts on Ebay! So having reminisced, on with the post. One of Douglas Adams’ other novels, Dirk Gently’s Holistic Detective Agency, is being adapted for radio and will be broadcast in Radio 4’s 18:30–19:00 “silly half hour slot” starting on 3 October. A total of three six-episode series are being made. Part of the fun of travelling backwards and forwards on the bus from Belfast to Heathrow is meeting interesting people. Tonight’s eccentric in the seat beside me was Mike. Having flown into Heathrow from Amman, he settling down on the short bmi flight to study his big white A4 folder. Stuck to the front was a sheet titled “Mike &Chuck’s Ireland Trip” - an itinerary taking them past 7 golf courses over the next 9 days. The file was packed with directions from the RAC website to take from the airport to the B&B and then on to the golf course and to the next B&B ... all planned out in meticulous detail for the next week. Having paid the 60p for his can of lemonade when the stewardess declined to take his 1 dollar bill, I got talking to Mike. A mad mission ... but harmless (if you discount the carbon footprint created by criss-crossing the globe). Vive les eccentrics! They (we) add colour to the world. And 60p well spent! I wondered why I’d carted a raincoat across to London when it had remained in my bag the entire time. No rain when I got the bus up to St Paul’s on Friday morning. And it was quite sunny when I left the building at quarter past five to trudge out to the airport. It was as I was crossing the road to go down into St Paul’s tube station that a car started honking its horn, and I eventually looked around to see a colleague hanging out the window yelling my name! He’d walked around to Barbican, and discovered that most of the tube lines were disrupted, and that Paddington Station had been closed (along with the Heathrow Express train). So he was having to taxi out to Heathrow instead. And in a serendipitous moment, I got a lift. Though we did have to stop off at a cash machine, and then the driver needed to get diesel. Oh and having got through the slow traffic at Kensington, we then ran into queues closer to the Heathrow turnoff. And there was the Mercedes that tried to overtake when there wasn’t room for it to squeeze past and nearly took the side out of the taxi. Although checked in online, my colleague hadn’t printed out his boarding card, and was after the 30 minute deadline so couldn’t get one from bmi departures staff. So while I wandered through the suspiciously quiet security with a few minutes to spare, I had this guilty feeling as he had to go on standby for the next flight. Our plane took off with his seat empty - leaving a queue of standby customers waiting in the lounge. But luck shone on him too as he got a seat on the last flight of the night … which enjoyed an aborted landing attempt at Belfast City before he eventually got home a couple of hours late. But at least we got home. Back home from a journey that took us from Portstewart (Northern Ireland) to Valence (France) and onto Lavigny (Switzerland). We had a great time. I'm now in the process of processing two 1 GB memory sticks full of photos. Expect some to appear on the blog and Flickr before too long. But in the meantime, a (news?) story caught my eye. My postie will hopefully thank me for not lengthening his arms by ordering a copy for delivery on Saturday. And with that number of copies being ordered for postal delivery, never mind the number of books that will be bought in bookshops and supermarkets over the weekend, someone I know should have a copy to borrow in a week or two! As I look out the window (it's 22:30 local time, I can see two sets of lights. One is from the headlights of a combine harvester in a nearby field. With the graun ready to be harvested, and the weather rainy until yesterday, the farmers have been working all day - and will continue all night - to gather in the now dried out grain. And with the weather due to break in southern Switzerland on Monday or Tuesday, there is a real deadline to meet. Two different sets of people celebrating. One marking history, the other thankful that this year's crops have survived the rainy weather. PS: Fort Boyard is on the Swiss TV tonight - same set, some of the same characters too! No sign of beating Lambeg drums, Orange collarettes, or pictorial banners as we left Valence this morning. The French must be combining their celebrations with Bastille Day on Saturday. So nothing unusual to report - except a train that left 5 minutes late and arrived bang on time (as opposed to an additional half hour late). My last missive from Valence noted the lack of swings and bricks in this area of France. Since then we've noticed swings in people's gardens, but still none in public parks. And some bricks were found in an exposed patchwork wall of a rural house. The weather turned too. On an post-dinner walk along a canal and across some playing fields last night, grey clouds gathered. Then the thunder and lightning started. That was about 8.00pm. The locals were playing boules and snacking at the little bar. Ten minutes later, the bar was boarded up and the boules' players had vanished. Bad sign. But despite the spectacular sound and light show, we had no more than 15 minutes worth of rain. Sitting out in the flat's little balcony three hours later, the lightning was still flashing and the thunder echoing all around the flood-plane that Valence is built on. And then about 3.30am there was another burst of thunder and lightning. Such a difference from the burning sunshine of Saturday. And so beautiful to watch the lightning arcing across the sky, like a celestial firework display. Looks like I caught two shots of the lightning on my camera ... no way to upload them until I get back home. But no where near as good as the fingers of lightning and panoramic flashes that lit up the hills while we just sat and watched, not bothered to take more snaps. Some people reassuringly tell their children that lightning is only "God taking their photograph". Well, he must have been playing with new digital camera over Valence last night! Hope he got some good shots - Google Earth/Maps would appreciate some more up-to-date images. Take a fair-haired, pale-skinned person from wet Belfast, and drop him in the fan-assisted oven of Valence in France. Apply factor gazillion sun-cream and watch the <s>tan</s> lobster red glow develop. By 11 in the morning, the ground is sizzling. And at 6 o'clock in the evening (18:00 if you're reading this in France) it's still uncomfortably warm outside. France - Valence anyway - is a country without swings. Too dangerous? Too much fun? Could lead to sunburn if left sitting in one too long? I don't know why, but even the biggest parks we've found don't have them. Instead they have metal slides, facing the sun, that are so hot by mid-morning that you'd need to kit toddlers out with asbestos trousers and gloves to be able to go down them. And supermarkets are full of every variety of Iced tea (the glace) except for the original lemon stuff. Peach, Mango, Isotonic, in bottles and cans, but no Lemon. 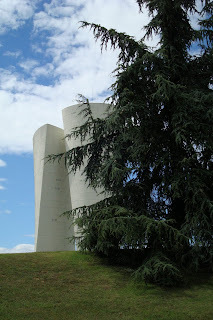 There was something a bit funny about the buildings on the road down from Lyon airport and in Valence. Last night I finally put my finger on it. No brick. Lots of red roof tiles, but not a brick in sight. Every building seems to have been constructed with thick walls of concrete. Given the strength of the sunshine, windows are bigger than expected, though they do all come with metal shutters to reflect (or absorb) the worst of the heat. Concrete - painted or unpainted - blurs into a sea of creamy-grey. All in contrast to the stonework and cosmopolitan architecture around the centre of Paris. I think Valence needs a touch of Kevin McCloud to cheer it up! ... Lyon airport who win the prize by a mile. Crawling at half the speed of any other airport, the bags are laid out on the belt, spaced with an artistic gap between them. Photo taken last Wednesday evening, on the day that Gordon Brown took over as Prime Minister, and hours before two car bombs were abandoned about 500 yards away from the hotel I was staying in. Over the last year or so, this blog has been getting hits from people looking for job adverts for the new Ikea store at Holywood Exchange. 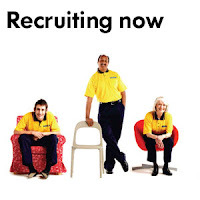 So it only seems fair to pass on the link to the Ikea recruitment site - www.ikea.co.uk/belfast (19 July - added a direct link to the list of jobs and closing dates - currently 8th August) - that is now looking for people to work in the Belfast kitsch warehouse. Update: And there's a recruitment event on the weekend of 28/29 July at the Esporta health club on the sliproad of the Holywood Exchange Junction. There are yelllow AA signs to guide you in! * If a car battery even loses only a few volts - say 9V instead of its normal 12V - it can be unable to start the car's engine. * Leaving an interior light on - perhaps a door not properly closed - is enough to run down a car battery in a day or so. So much for energy management! * You can recharge a car battery by running the car in neutral, or driving it along, for 15-20 minutes, though you need to turn off as many lights, radios and fans etc to maximise the charging process. Hillside Recovery in Coleraine arrived shortly after an hour, and dealt with the problem in a very friendly and helpful manner - even though they must be sick and bored of flat batteries! * Zio Portrush is no more and has changed hands. It was brilliant to read a few minutes ago the news that Alan Johnston has been released in Gaza after 114 days! This time last year (maybe a couple of weeks earlier) we spent a few days up in the north coast town of Portstewart. Has much changed in 12 months? The Topiary golfer isn't on display - the balcony of the house (link to last year's post to be added) is bare. The National Trust own and look after Portstewart Strand. This year the portakabins beside the entrance gate are being replaced with wooden huts, complete with turfed roofs - providing both insulation and camouflaging the construction. At nine o'clock last night, carpenters were still working on the decking - looks like the "ready for summer 2007" on the poster was a little too ambitious! There are sea front apartments that weren't even building sites last summer. And lots more sites raised to the ground, with cranes, JCB diggers and foundations being laid. 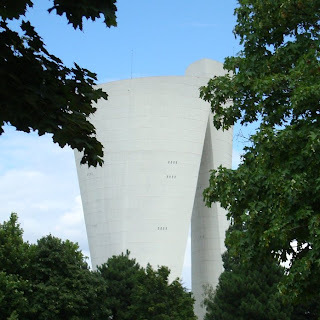 Some good architecture - and some lousy concrete creations. More worryingly, there is less and less green space as you drive from Portstewart across to Portrush. Soon it will be built up the whole way. It's sad to see the countryside disappear, and be replaced with occassionally occupied second homes. Now just to wait for the local recovery firm to arrive to get a car started. Sea air and modern cars don't mix! And from the machine gun-like noise the car is making when the ignition's turned, I'm not sure it's a simple battery problem. Fingers crossed.